In the early 1960s, when I was attending elementary school in Montreal, two different school boards administered two separate public school systems: the Roman Catholic school system for Francophones, and the Protestant one for Anglophones. As a Jew born to primarily English-speaking parents who were neither eager nor able to send me to private Jewish parochial institution, my only option was to go to the Protestant school in our predominantly Jewish suburb. There I stood in class every day to belt out “God Save the Queen” or “Oh Canada,” sing a hymn or two from a hymnal, and recite the Anglican version of the Lord’s Prayer. Our rights to self-expression, our freedom to be devoid of faith or to live by it in a bounty of forms -- these are gifts that are both granted and suppressed by governments, not God. My classmates and I found the experience a bit mystifying. Not having been educated in Christian theology, we were perplexed by having to seek forgiveness for trespassing – a prohibition we associated only with the stern signs planted in the new home construction sites in our burgeoning neighborhood. We were creeped out at the prospect of walking through the valley of death, unsure of whose rod and staff would comfort us, but pretty sure it wasn’t Rabbi Becker’s. I wasn’t traumatized by having to enact someone else’s beliefs so much as alienated. But I also didn’t question it until immigrating to the United States at the age of 10, when I gratefully noticed that I no longer had to. Our move to Michigan wasn’t without pain. I had a funny Canadian accent, and was clueless about what an "ice cream social" was, why paper bags were called "sacks," and why Michiganders had such an aversion to pronouncing words containing double o's as they were meant to be articulated, choosing instead to refer to "roofs" as "ruhfs" and "roots" as "ruhts." More significant, I moved to Michigan at an age when my curly hair, budding breasts, and shyness would have made daily life excruciating anywhere. But those routine agonies of early adolescence were at least mitigated by the fact that otherness was not defined by one's family’s creed. In my new middle school, tribalism was rampant, and kids rose to coolness and fell from it in the course of weeks. I dwelled on the periphery of several cliques, but at least I was no longer the misfit in a culture borne from the mating of authority and (someone else’s) theology. While religious homilies abounded on greeting cards and church signs, they didn’t issue from the mouths of public school teachers. And they most certainly didn’t fuel the stump speeches of politicians. In 1964, I had moved to a country that nobody had declared as founded in any religious tradition, not even a Judeo-Christian one. That country is practically unrecognizable during this election season. Ted Cruz, Mike Huckabee, and Marco Rubio brandish their religious faith like Samurai swords, casting themselves as loyal defenders of God (though as campaign finance records prove, the nobles of the finance and energy industries are their more immediate patrons). During the most recent Republican debate — prior to the evangelically-driven Iowa primary, you could practically hear Rubio smack his lips when asked if he was the “savior” of the Republican Party. “Well, let me be clear about one thing, there's only one savior and it's not me,” he intoned with self-aggrandizing piety. “It's Jesus Christ, who came down to Earth and died for our sins." This alleged attack is more than just another attempt to fan the fire of aggrievement that fuels their candidacies. It’s a canny, dangerous attempt to turn reality on its head. 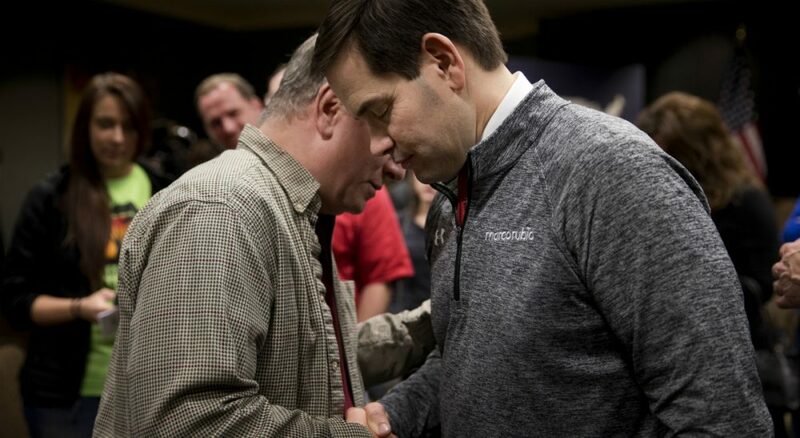 After all, nobody prevented Rubio from running a political ad in Iowa stating that “Our goal is eternity, the ability to live alongside our creator for all time, to accept the free gift of salvation offered to us by Jesus Christ." Fortunately, by the same token, nobody is prohibiting me from declaring how objectionable I find this kind of campaigning … yet. So while I still can, let me say that every time I see these kinds of ads and hear this kind of language in the context of political debate, I feel assaulted. ...there's a difference between articulating values informed by religion and weaving theology into our political discourse. Judging from Monday's results, the Republican caucus voters of Iowa approve of these candidates' moral values. But there's a difference between articulating values informed by religion and weaving theology into our political discourse. Our rights to self-expression, our freedom to be devoid of faith or to live by it in a bounty of forms — these are gifts that are both granted and suppressed by governments, not God. And when demagogic would-be leaders promote the view that political institutions are manifestations of God’s will, I worry that it’s just a matter of time before my granddaughters will be reciting someone else’s prayers. Do We Expect Too Much Of Our Politicians?